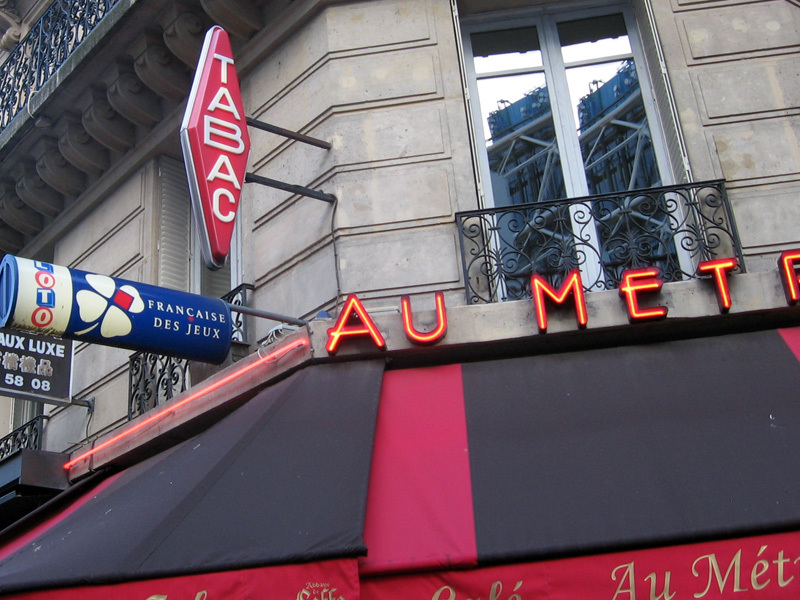 Le tabac (pronounced "ta-bah"; the c is silent) is the name for the tobacco shop, or the tobacco counter in some bars. This is the place to get your smokes, phone cards for your pre-paid phone, and hey, what the hell, why not get some lottery tickets while you're there? The tabac has all that stuff. You can always spot a tabac by the red diamond-shaped sign out front (as pictured above). The shape is meant to represent a cigar. Sometimes the signs are neon, sometimes they say "tabac" in them, but they're always red and always cigar/diamond-shaped. Sometimes you'll spot a tabac sign and you'll go in and it's just a small shop selling smokes, and sometimes it'll be a counter in a bar; larger bars sometimes have a separate tabac entrance so you can bypass the bar area and go directly to the tabac counter. I've never been a smoker, so my relationship with the tabac is just that that's where I used to buy credit for my crappy pre-paid phone for my first several years in Paris. I wrote about this a bit in my article about pre-paid phones, including instructions for buying credit for the various phone companies. France has really clamped down on smoking in public in recent years. You can't smoke in most bars these days, and there are really very few public places where you can smoke inside. The tabac is one exception to this rule. Actual tobacco shops generally allow smoking, and they sometimes have a few small tables and chairs where old guys smoke and scratch off their lottery tickets. Bars with a tobacco counter may or may not allow smoking; depends on where you are. When in doubt, assume that you can't. You can always ask!